A dismissed sergeant, who has been jailed twice for impersonation, may be on his way back to prison after he was arrested a third time for the same crime. This time he even gave himself a higher rank. The man identified as Femi John, 52 revealed why he has refused to give up impersonation. He said: “I want the police to take me back. What I did six years ago that led to my dismissal was just a hasty way of getting money to meet some needs. John, who was arrested by the Oyo State Police Command, confessed to have been dismissed in 2012 for diversion of a 33,000-litre fuel tanker in Oyo State. According to the suspect, he sewed police uniform and presented himself as a policeman because he had to eat and feed his family. “What else can I do to make a living? This is the only job I know and love,” he added. Although the commissioner and PPRO repeatedly told John that he couldn’t be reabsorbed into the police, he insisted that he should be taken to Abuja, so that the process of taking him back would start. Speaking with journalists, John said: “I was once a police sergeant. It was condition that forced me into impersonating. It was the problem I had while I was in service that led to my dismissal. I was dismissed because I diverted a truck loaded with 33,000 litres to somewhere in Fiditi to sell. After I sold it, I was arrested, tried and dismissed. “I have been parading myself as a police officer simply because I needed to look for something to eat and feed my family. I have been arrested twice, and I was charged to court. 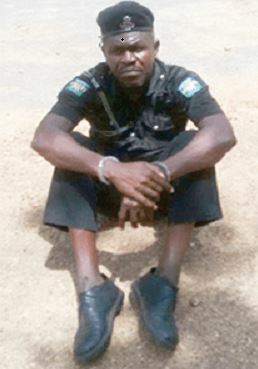 "I served just four months for my first offence, and six months for my second time in Agodi Prison.